Though there are lotsa of things we dont see eye-to-eye, I know you still love me and only want the best for me. I am sorry for being such a brat sometimes. You are someone who listens to my daily ramblings. Thank you for bringing me up and loving me. now i know that shuyin isn't skinny as a baby and when she is pregnant. i wonder how you'll be after you've given birth... interesting. 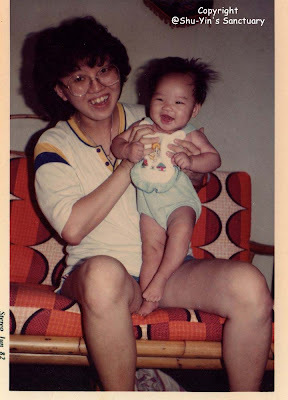 shuey...oi...haha..i was a chubby baby til around 4-5 i think.